Texas Department of State Health Services (“DSHS”) Commissioner Dr. John Hellerstedt was quoted in an April 7, 2017 news release saying “Zika remains a significant health risk to pregnant women and their babies, and it’s only a matter of time until we see local transmission here again,” prompting the state to “cast as wide a net as possible with testing.” Dr. Hellerstedt noted that the Lower Rio Grande Valley remains most at risk. 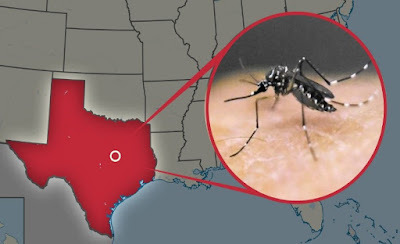 At the end of 2016, Texas became the second state (following Florida) within the continental United States to report local Zika virus transmission by mosquito. According to related health statistics, a total of 320 cases of reported Zika mosquito transmission were reported in 2015 and 2016. Specifically, at the end of 2016, there were six confirmed cases of local Zika insect transmission in Brownsville, Texas. Now, recent data (for the week ending April 7, 2017), shows ten locally transmitted Zika cases have been newly reported in Texas. Meanwhile, the Center for Disease Control continues to track the spread of Zika Virus around the world and to provide guidelines and advisories for US Citizens and Residents living within the US and for those traveling outside the US to effected countries. Zika is a mosquito-borne virus akin to dengue fever and West Nile infection. Once bitten by an infected mosquito, a person serves as a host for the virus for several months. An infected person can also transmit the virus to others sexually. The virus can cause fever, rash, muscle and joint aches and red eyes (conjunctivitis). Symptoms are usually mild, which is why most adults do not know they have been exposed to Zika. The absence of any symptoms also makes the Zika virus difficult to detect. Zika has a much more damning effect on pregnant women. Zika has been linked to a severe neurological birth defect called microcephaly. Microcephaly stifles fetal development. The most notable result is seen in babies born with undersized heads. Federal health data confirms that one in ten Zika infections during pregnancy in 2016 resulted in birth defects of the child. Further elevating the severity of this infection is the lack of any vaccine or treatment for Zika. DSHS anticipated that the southernmost areas of Texas would be most likely to support local mosquito transmission of Zika. In response, it expanded the testing threshold for symptomatic pregnant women in Cameron, Hidalgo, Starr, Webb, Willacy, and Zapata counties in October 2016 to quickly diagnose and prevent further spread of the disease. Following the breakout of several cases in Brownsville, DSHS revised its recommendations, and implemented mandatory testing of all pregnant women residing in Brownsville or who have traveled to Brownsville on or after October 29, 2016. A mild winter prevented a break in the mosquito season in the southernmost areas of the Rio Grande Valley, and Zika virus transmission continues in Northern Mexico. Texas health officials continue to expand testing recommendations as the warm weather increases the risk for local transmission of the virus. Residents of the Lower Rio Grande Valley, including Cameron, Hidalgo, Starr, Webb, Willacy, and Zapata counties are strongly urged to stay vigilant in their efforts to prevent Zika transmission. Currently, testing is recommended for all pregnant women at their first prenatal care visit and again in their second trimester. Testing is also recommended for any residents who exhibit a rash and at least one other common Zika symptom, including fever, joint pain, or conjunctivitis. The current comprehensive guidance on Zika testing can be found at http://texaszika.org/healthcareprof.htm.